The esteemed pianist Richard Frank was born in Zurich, Switzerland. He studied at the Zurich Conservatory with Irma Schaichet, a student of Bartok and Busoni. Mr. Frank received a teaching certificate in piano SMPV. He was awarded his Artist Diploma at the Academy of Music in Freiburg, Germany under Professor Edith Picht-Axenfeld. In both l976 and in 1977, he won the prestigious Kiefer Hablutzel Prizes. Mr. Frank also studied at the Juilliard School in New York, taking Master Classes with the late Rudolf Firkusny. Richard Frank has given concerts in Europe, the USA, China, Singapore and Japan. He appeared as soloist with orchestras around the world, including the Sudwestdeutsche Philharmonie Konstanz and the Symphony Orchestra Villingen-Schwenningen in Germany, the Szeged Symphonic Orchestra in Hungary, the Neues Orchester Basel and the Symphonisches Orchester in Zurich/Switzerland, the Carlsbad Symphony Orchestra, the Solisti di Praga and the Virtuosi di Praga in the Czech Republic, the York Symphony in the USA, the Century Orchestra Osaka and many other professional orchestras in Japan. Mr. Frank's illustrious career in chamber music includes partnerships with such world renowned artists as violinist Vaclav Hudecek (Czech Republic), Ruggero Ricci (USA), Gernot Winischhofer (Austria), Seiji Kageyama (Japan), cellist Anton Niculescu (Romania), clarinetist Stepan Koutnik (Czech Republic), and Michele Incenzo (Italy). He also perfoms regularly with the Dolezal Quartet and the Stamic Quartet (both from Prague) .Richard Frank's active recording career includes collaboration with the Artists of the Liszt Society. 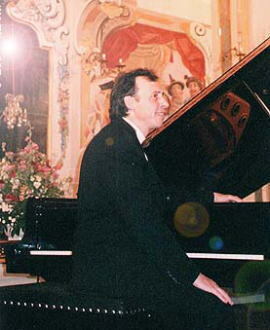 His two recent CDs have been released to critical acclaim: Franz Liszt: The Complete Piano Concertos (Szeged Symphonic Orchestra, Robert Hart Baker, conductor) on the Aurophone label and in 1999, Cuore di Napoli (Opera Fantasies and Neapolitan Songs for clarinet and piano solo) recorded at Radio Vaticana. Intensive involvement in the work of Franz Liszt led him to found the Franz Liszt Society Switzerland Japan, which regularly receives international acclaim for its innovative concerts and artistic ambassadorships. Richard Frank currently serves as President of the Society. Mr. Frank is in great demand as a music teacher by piano students from around the globe. He is on the piano faculty of the Music Department at Doshisha Women's College in Kyoto and teaches chamber music at the University of Education in Kyoto. He also taught Master Classes at the Summer Academy in Lenk/Switzerland, at the Accademia Musicale Ottorino Respighi in Assisi and in Orvieto/Italy, the Intern.Piano Workshop of Kromeriz/Czech Rep. and at the State Academy in Shanghai/China. In the United States , Mr. Frank has been invited as Visiting Artist and Guest Lecturer at the College of St. Elizabeth in Morristown, NJ. For his multifaceted international musical achievements as performer, pedagogue, and impresario, Richard Frank has been listed in the INTERNATIONAL WOH'S WHO IN MUSIC AND MUSICIANS' DIRECTORY of the International Biographical Centre Cambridge/England.